Both should prove to be a ton of fun... prizes, games, and conversation on the MB's. Oh, and there are as of last night, only a couple of the kits left for July available at The Scrapping Spot.... their flying off the shelves! i'm stoked too! 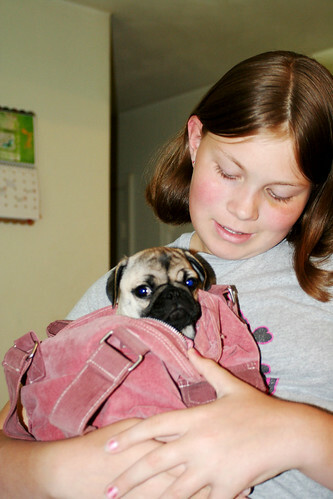 love the pug in a purse. how freakin adorable!! and congrats on designing the kit! im sure it will be fab! I LOVE LOVE LOVE your kit's NAME!!! Perfect. I can't WAIT to see your kit Leah! ooooooohhhhh..... i want a doggie like that!!!! girl, you are one busy WOMAN! loving the baby!!! so cute! and congrats on all the work you are able to do, I don't know how you manage! the music rocks sister! miss you so much!!!! love your kit. love u.